Chicago is a city known for its ice cold winters, its vibrant neighborhoods, and its bustling food scene. With its large Latino population, it comes as no surprise that the Latin food scene in Chicago is unparalleled. From your traditional Pilsen tacos, to street carts selling elotes, it’s pretty hard to choose where to eat. So I’ve narrowed it down for you. From arepas to Pabellón, nothing beats this city’s authentic and delicious variety of Venezuelan food. If you’ve never tried Venezuelan food, or if you’re already obsessed like I am, here’s a list of restaurants you shouldn’t miss. You’ll thank me later. Location: 1637 Montrose Avenue and 29 E. Adams Street. With two locations in Chicago, there’s no reason not to give Bienmesabe a try. Tip: Bring a case of your favorite beer because Bienmesabe is BYOB. Location: 4253 West Armitage Ave.
What to get: According to Yelp, some of the popular dishes include the Cachapa (think corn pancakes), La Rica Arepa (shredded beef, chicken, gouda cheese), and the Patacones (tostones sandwiches with your choice of chicken, beef, or both). Almost every item on the menu is gluten-free and the prices are unbeatable. Tip: Save some room for desert and try the Tres Leches cake. I promise you won’t regret it. Tip: La Cocinita also has a food truck that drives around The Loop. If you ever happen to see it, make sure to stop by. Location: 824 W Belmont Ave.
What to get: This casual and affordable restaurant specializes in Venezuelan sandwiches, coffee, and smoothies. From the La Pelua Sandwich with shredded beef, fried plantains, gouda, and garlic/cilantro sauce to the banana, strawberry, Nutella, and almond milk smoothie, you really can’t go wrong with 11 Degrees North. These are arguably some of the best arepas in Chicago. Tip: Did I mention they deliver? Location: 2604 W Lawrence Ave.
What to get: The reviews here don’t lie. This Chipotle-style restaurant should not be passed up. Although the arepas are pretty reputable here, the small restaurant also offers bowls and salads that look unreal. Known for their freshness and unique flavors, lose your Venezuelan food virginity at Sweet Pepper. Tip: Vegans—look no further than Sweet Pepper to satisfy all your Venezuelan food desires. So there you have it. Some of the best Venezuelan food in Chicago. Put the tacos and burritos down and venture to a new territory of Latin America (in Chicago). 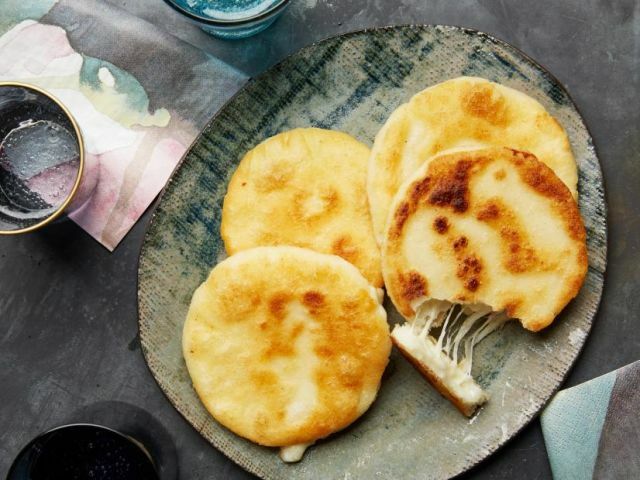 With its unbeatable flavors and ingredients, you’ll be dreaming of arepas in no time. Now THIS is a Bar We Can Get Down With!